Sean Hanlon and his mother, Kerri, at the 2014 Philadelphia Film Society premiere of “On the Other Side of the Fence” at the Roxy. Sean Hanlon starred in the film. 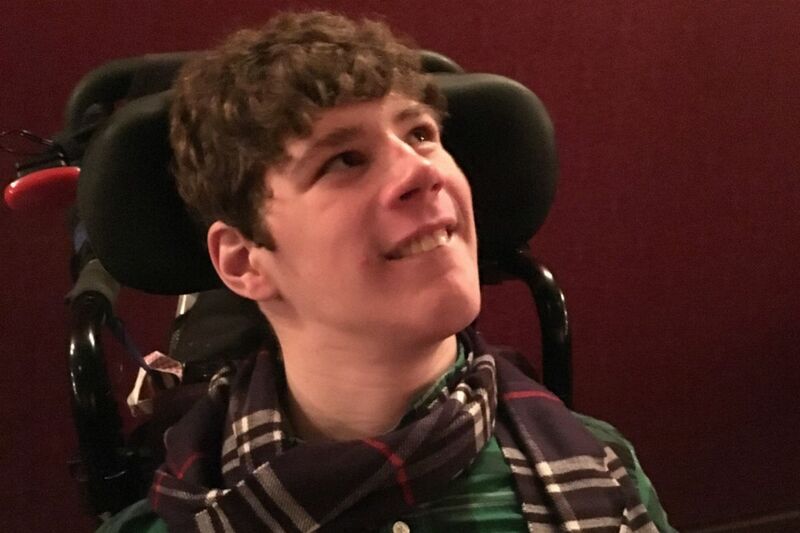 Sean Patrick Hanlon, of Conshohocken, 19, a guiding light who never spoke or moved about on his own because of severe cerebral palsy, but whose magnetism helped bridge the gap between those with and without disabilities, died Thursday, Aug. 24. Mr. Hanlon died of respiratory arrest at Children's Hospital of Philadelphia, his family said. He had been hospitalized many times to combat the respiratory problems and other medical issues associated with his condition. "While his time here was short, his impact was tremendous," his family wrote in a tribute. Mr. Hanlon's engaging personality overspread the HMS School for Children With Cerebral Palsy in Philadelphia, where he studied, St. Philip Neri Parish in Lafayette Hill where he worshiped, and Yoga Home, his mother's business, where he did yoga. He navigated with the help of a wheelchair and by touching words and images on a computer lapboard attached to his chair. His "yes" was a direct smile facing forward, his "no" a sideways-turned straight face. "He smiled with his entire face, particularly his eyes," said Rachel Ezekiel-Fishbein, a publicist who has assisted the Hanlons. "And he radiated joy and love. Most of all, he changed the world, and so many of our perceptions of people with even extreme disabilities, by showing us what he could do." Mr. Hanlon loved music, art, and outdoor adventures – hiking, biking, kayaking, yoga, skiing, and annual camping trips, all undertaken with the help of his family. He ran in Valley Green along the Wissahickon Creek, toured the Grand Canyon and the Cliffs of Moher in Ireland, waded the Narrows in Zion National Park, Utah, and skiied Mont Tremblant in the Laurentian Mountains of Quebec, his family said. On many of these adventures, he rode on the back of his father, Brian. He was best known for being a movie star. Mr. Hanlon appeared in a 2015 documentary about students at HMS and Germantown Friends School who teamed up in pairs to stage a musical with the underlying theme of acceptance and empathy for those who are different. The film, On the Other Side of the Fence, garnered attention from the United Nations, from the New York International Film Festival, and at the Mid-Atlantic Emmy Awards, and Mr. Hanlon attended to accept the awards. "I think Sean is tremendously proud to show everyone this film and allow more people a glimpse into his world," said his mother, Kerri. "We have an article about the film hanging at Yoga Home, and he gets a huge grin every time someone greets him with, 'It's the movie star.'" Asked a series of questions about the documentary, Mr. Hanlon told the Montgomery News website in 2014 that he was "proud of the movie and so happy to share it with his family and friends." He told the News he was also "excited to see himself and his friends on the big screen" and was "especially happy for everyone to see why his Germantown Friends performing partner Ezra was 'so cool'." Sean Hanlon and his mother, Kerri, prepare to do yoga. Mr. Hanlon also was responsible for his mother, a yoga instructor, discovering that yoga can be accessible to those who can't purposefully move their limbs. While Mr. Hanlon was hospitalized with pneumonia in 2012, his mother queued up some soothing music, unrolled her mat on the floor next to his bed, and began to do yoga. Within minutes, Mr. Hanlon's oxygen saturation improved and his heart rate, which had risen as he struggled to breathe, returned to a normal level. "He was simply breathing, relaxing into his body, and coming into community with my breath," his mother said. "It wasn't until this moment that I realized Sean needed yoga just as much as I did, if not more." Soon after the hospitalization, Mr. Hanlon's mother partnered with Maura Manzo to open Yoga Home, a studio in Conshohocken that offers sessions for those with and without disabilities. Mr. Hanlon did not stop there; he became a teacher, too. On May 12, he and his mother were the keynote speakers at the Children's Hospital of Philadelphia 41st annual regional conference on developmental disabilities. Their presentation, "Yoga and Mindfulness for All," included a demonstration of yoga adapted to Mr. Hanlon's condition. "Participants could see the benefit when his face lit up in a smile," the Conshohocken Courier reported. He was scheduled to appear at the Oct. 6 to 8 Accessible Yoga Conference in San Francisco, his mother said. "His legacy will live on," his mother said, although she has not decided whether to appear this year without him. Besides his mother and father, Mr. Hanlon is survived by siblings Kyra and Connor, and grandparents Mark and Mary Hanlon. Services were Monday and Tuesday, Aug. 28 and 29. Burial was in Calvary Cemetery, Conshohocken. Donations may be made to the Sean Hanlon Memorial Foundation, 1950 Butler Pike, Box 267, Conshohocken, Pa. 19428.